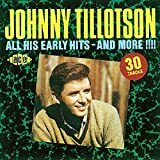 Johnny Tillotson's, "It Keeps Right On A-Hurtin'"
Wishing I could hold you tight. Life seems so empty since you went away. And it keeps right on a-hurtin' since you're gone. It keeps right on a'hurtin every minute of the day. Every hour you're away, I feel so lonely. And I can't help it, I don't think I can go on. I've always loved this song for its glorious melody that could fit any number of uplifting messages. But the lyrics here are instead the lament on one saying "I don't think I can't go on" because of his grief and loneliness over a lost love.